Gorse (Ulex europaeus) produces many seeds per season which can be viable for a long period, especially if the seed is buried underground. In the more temperate climate areas gorse has two reproductive periods per season. Craig Sixtus, who was studying gorse for his master's degree, investigated gorse seed viability to see if viability was influenced by altitude or climatic conditions. The sites were different altitude and climatic areas. The sites were Bainham, Onekaka, East Takaka, Hinewai Reserve, Trotters Gorge and Lake Ohau. Sites were inspected monthly and if there were seeds in the seed trays, they were removed and taken back to the laboratory. Samples were also taken from the pods on the bush when they were mature. When the seeds were tested for viability, scarification with concentrated sulphuric acid was used, which Craig had previously tested for (New Zealand Plant Protection, 2003). The results showed that gorse produced mature seed pods almost continuously in the Golden Bay region (Bainham, Onekaka, and East Takaka). In the southern regions seed was only produced in the spring. The seed fall for each month varied from 0–256 seed/m2. The germination of all fallen seed was similar, regardless of soil type, climatic conditions or site altitude. However, there were month-to-month differences. Seed from pods sampled during summer show that, and Golden Bay, gorse seed viability (60%) was higher than seed produced further south (30% at Lake Ohau). These results were published in the Agronomy New Zealand Volume 34. Now Craig is about to begin his study for his PhD where he will study the phenology of the gorse pod moth and the impact that it has on the seed production of gorse throughout New Zealand. He will be testing the moth at various sites, including several North Island ones, as far north as Northland. Most people know that gorse is a major prickly problem weed. Gorse (Ulex europaeus) was introduced to New Zealand as a stock food and hedge material. However, our climate suited it and in a lot of New Zealand there were two reproductive periods. In a short period there were a lot of seeds underground and it wasn’t long before it was declared a noxious weed. 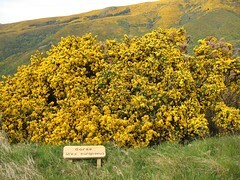 Prior to the 1990s, control of gorse was principally by the use of chemicals. However, the public realised there was a high risk of danger from some of those chemicals, so they started to request alternative control methods. Landcare Research and others began to study biological agents of different weeds. In Europe there are 94 invertebrates recorded that feed on gorse. This research found that 78 were not considered safe biological control agents because their host-range was too wide. Of the remaining 16 species which were sufficiently host-specific biological control agents, five attack reproductive structures and 11 feed on green shoots. One of the biological agents released in New Zealand was the gorse pod moth (Cydia succedana). This agent’s larvae enter the gorse pod and munch away on the seed. The larvae will enter several pods before they pupate. Recent Lincoln University masters student, Craig Sixtus, who is fascinated by the tenacity of gorse, studied the phenology of the gorse pod moth on gorse in Canterbury. Pheromone traps were set at McLeans Island, a warm, lowland site and Hinewai Reserve, a cool, upland site. In Craig's study it was found that spring gorse flowering was synchronised with the presence of the moth at both sites. There was less synchronisation with moth flights and flowering in the second generation at McLeans Island. There was no second flowering generation at Hinewai Reserve. These results show synchronisation between gorse flowering and gorse pod moth, especially spring gorse flowering. However, there was seed production outside the larval feeding of the gorse pod moth. These results were published in the New Zealand Plant Protection Society Volume 60. Now Craig is about to begin his study for his PhD where he will study the phenology of the gorse pod moth and the impact that it has on the seed production of gorse throughout New Zealand. He wants to see if the difference in climatic conditions affects the performance of the seed muncher. It would seem like a no-brainer to suggest that New Zealand is made up of a group of oceanic islands. After all, New Zealand IS a group of islands set in, what can only be described as ocean; with plenty of it in all directions. However, most descriptions about the history of New Zealand emphasize the point that New Zealand is a continental island and therefore very different in origin than oceanic islands. What’s the difference? 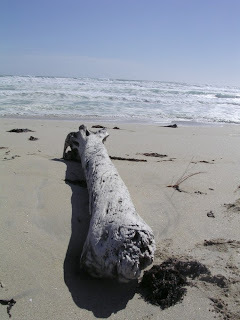 Oceanic islands are islands that have been generated in mid ocean, usually by volcanic activity. They are emergent from the sea. The Galapagos Islands are a good example of this. Continental islands, on the other hand, were once part of larger landmasses that have become isolated from these continents. New Zealand was geologically once a part of the large continent of Gondwanaland and qualifies as a continental island. Or does it? A review paper by Julia Goldberg and Steve Trewick (Massey University), with Adrian Paterson (Lincoln University) has challenged this idea. 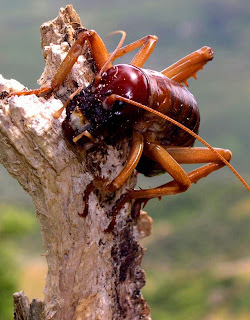 The paper, published in the Philosophical Transactions of the Royal Society B, is part of a special issue on “Evolution on Pacific Islands: Darwin’s Legacy” and is entitled “Evolution of New Zealand’s terrestrial fauna: a review of molecular evidence”. The authors argue that several observations are commonly made about the New Zealand and its natural history: 1) New Zealand is isolated from other landmasses. 2) The biota is unique. 3) There is a high level of endemicity (species only found in NZ). 4) It includes many behaviourally or morphologically strange and distinctive taxa (divaricate plants, strange reptiles, giant birds). 5) The composition of the biota is disharmonic (some groups are over-represented and many are not found in NZ at all, no snakes, few ants and mammals). These observations have generally been interpreted as the result of a long isolated continental island biota. However, Goldberg et al challenge these points: 1) Physical isolation does not equate to biological isolation (all oceanic islands with no mainland links eventually end up with relatively large biotas). 2) All biotas of distinct areas are, in fact, unique! (That's what makes them distinct!) 3) Endemicity is usually high on islands, including oceanic islands like Hawaii. 4) Distinctive taxa are common products of evolution on islands, like the Dodo and Galapagos finches. 5) Disharmonic biotas are best explained by random colonisation and extinction events (It is often somewhat unpredictable about which species will successfully colonise). Their conclusion is that New Zealand is no different from most other oceanic islands. 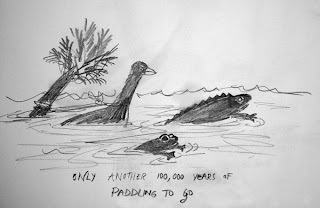 Recent geological reappraisals have also suggested that New Zealand (or Zealandia) was inundated about 24 million years ago and then rose out of the sea from about 21 million years ago (see The fall and rise of NZ). If this is the case then, despite the fact that NZ has continental geology, New Zealand is an oceanic island. Goldberg et al reviewed the molecular data that have accumulated over the last two decades for New Zealand taxa. This data allowed scientists to examine evolutionary relationships of species and the time of divergence of lineages since their last common ancestors. They looked at links between New Zealand and Gondwanan landmasses, Australia, the Pacific, the Chathams, and within New Zealand. The overwhelming pattern of most of these studies is that taxa have arrived in New Zealand since the break up of Gondwanaland (see also The different meanings of Gondwanan) and that diversification is relatively recent. Again this is consistent with New Zealand being an oceanic rather than continental island. This is a major challange to our understanding of New Zealand's natural history and should stimulate debate for years to come. Many tonnes of bait containing the poison 1080 (sodium fluoroacetate) are dropped on native forests every year in New Z ealand to control possum numbers. ERMA (the Environmental Risk Management Authority) has recently reassessed the use of this compound and found that it is still the most useful poison that we have to deal with our major pest problem in New Zealand. There are, however, still many concerns expressed about the use of 1080. One issue is that 1080 may leach into soil and then be absorbed by plants. Of particular concern is whether 1080 is being absorbed into native plants used by Maori for food and medicines, as these plants grow and are harvested in areas that may be included in 1080 drops. Lincoln University researchers Shaun Ogilvie and James Ataria, with collaborators from Ngai Tuhoe and Department of Conservation, have published in Ecotoxicology the results of experiments on 1080 uptake in plants. 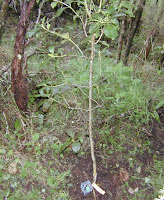 In association with Ngai Tuhoe (of the eastern central North Island), experiments were done in a forest block just south of Lake Waikaremoana. 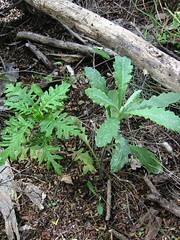 Two plant species were selected for the trials. Pikopiko (hen and chicken fern, Asplenium bulbiferum) is a species of fern where emerg ing shoots are used as food. Karamuramu (Coprosma robusta) is a small tree species used as an internal and external medicine. 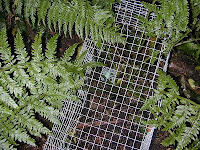 Ten healthy specimens of pikopiko were enclosed in wire mesh cages and a single cereal 1080 bait was placed at the base of all the plants of both species in a smaller mesh cage to prevent disturbance by rodents. Samples from each plant were taken several times from 0-56 days after the bait was placed. The samples were then analysed for 1080 concentrations using gas chromatography. No 1080 was found in any pikopiko samples. 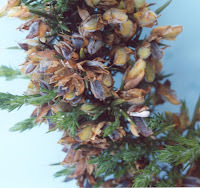 1080 was detected in one karamuramu plant on days 7 and 14 at between 2.5 and 5 ppb (parts per billion), representing about 0.0004% of the 1080 present in the original bait. The researchers calculated that to reach a lethal dose of 1080 for a 70 kg human that the person would need to consume about 28 tonnes of karamuramu! It was concluded that the risk to humans from 1080 absorbed into these plant species was negligible. 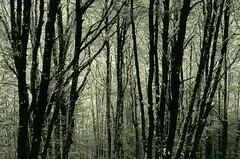 The southern beeches of New Zealand (Nothofagus species) make up a major forest-type which is extensive throughout the North and South Islands. Studies in beech forests usually focus on the roles of the trees as canopy for forest-floor ecosystems. A new study by John Marris and Rowan Emberson (Lincoln University) in association with James Johnson (University of Idaho) looked at the trees themselves as a habitat. More specifically, they examined the insect community on sooty mould - the characteristic black fuzz seen on the trunks and branches of some southern beeches. The mould grows on the sugary excretions of scale insects (Ultracoelostoma species), often forming a thick mat that provides a rich environment for invertebrates. In a paper published in The Coleopterists Bulletin Marris, Emberson and Johnson describe how they collecte d sections of beech branches from near Oxford, Canterbury, and placed them into rearing containers. After a week numerous beetle specimens were collected in the trap jar, or by hand as branches were manually searched. Underlining the hidden diversity of New Zealand ecosystems, seven different beetle species were collected from one Oxford branch. The most exciting find was of the beetle Metaxina ornata, the only member of the family Metaxinidae, which is unique to New Zealand. This species is rarely collected but was found to be common in their samples. Collections from Kaikoura and Craigieburn gave similar results. How can such a small and uniform ecosystem like the branch of a beech tree support so many different species? The beetles probably take advantage of the scale insects, harvesting both the honeydew and the scales themselves. 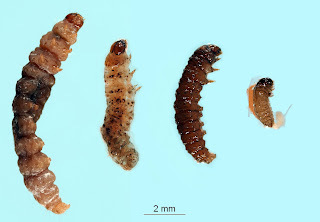 Several of the predatory Metaxina larvae were found inside scale tests (shell-like structures surrounding the scale insect), presumably after eating the former occupant. The pink-tinged gut contents of the larvae matched the pink colouration of the scales - smoking gun evidence of predation. Studies like this are fascinating for how they show just how little we know about the natural history of the hidden world of invertebrates. New Zealand's agricultural, horticultural, and forestry industries are battling an increasing number of weed species that reduce their productivity. Similarly, wildlands in New Zealand, like in many parts of the world, are coming under increasing pressure from invasive plants (weeds) that harm native biodiversity. Ecologists are working hard to try to figure out why a certain minority of introduced plants become troublesome weeds while most remain well behaved. If we could accurately predict which introduced species will become weeds, they could be controlled or eliminated before they became too widespread to stop. Recent Lincoln University masters student and Fulbright scholar, Kelly Gravuer, tackled this problem of how to predict invasive plants, using the well-documented history of clover (Trifolium) introductions in New Zealand. Her results were recently published in the Proceedings of the National Academy of Sciences (USA). Why clover? While there are no native clover species in New Zealand, nobody is leaping about with a backpack of herbicide killing the many introduced clover species. Quite the opposite. As nitrogen-fixing plants, clovers are vital to pastoral farming. Clover roots contain clover-specialised Rhizobia bacteria, also introduced into New Zealand, which convert nitrogen from the air into nitrogen fertiliser for the soil. It is exactly because clovers are such useful plants that their biology and introduction into New Zealand have been exceptionally well documented, far better than weeds. 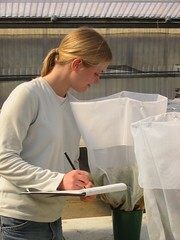 Kelly concluded that clovers offered an excellent opportunity for ecologists to test and refine their methods of predicting plant invasion success. Kelly's sleuthing revealed that of the world's 228 clover species, 16 clover species that had never been intentionally introduced here are now wild in New Zealand. These were likely introduced accidentally with soils and other seeds. A further 56 clover species were intentionally introduced to New Zealand, only nine of which are now found in the wild in New Zealand. Kelly also compiled the distributions of all 25 wild clover species in New Zealand. With this information and a small encyclopedia's worth of information about the biology of each species, Kelly set to work searching for traits that separated the wild (naturalised) species from the cultivated species, and the widespread naturalised species from the rare ones. What she found was surprising. What separated the successful invaders from the other clovers was not a particular combination of biological traits but largely the extent of species' association with people and human activities. This is despite an impressive diversity of biological traits among the New Zealand clovers. The clover species most likely to have been introduced to New Zealand, most likely to have naturalised, and most likely to be widespread, were all those species closely associated with people. Of the nine intentionally introduced species that have naturalised, eight were widely grown commercially in agriculture. Those naturalised species that had not been intentionally introduced were typically species that occurred naturally in Britain, the main source of early European settlers for New Zealand, and were commonly recorded as seed contaminants in the early decades of New Zealand agriculture. Those naturalised species that became widespread in the wild had similarly strong associations with agriculture. Just knowing the biology of the species was of little use in predicting which species would be successful invaders. You had to know the extent and type of association each species had with people. What does this mean? One message from Kelly's work is that it is going to be difficult to predict which cultivated plants will become future weeds without carefully taking into account what people do with these plants. For example, popular garden plants will be more likely to become weeds than unpopular plants, even if their popularity is solely determined by human aesthetics like flower colour or international gardening fashions and is unrelated to the plant's growth and seed production. Most future weeds are likely to be very familiar to us—like Agapanthus, wilding pines, and kiwifruit—rather than obscure species that accidentally slipped across the border and spread without our help. We all know the joke about the chicken crossing the road. It’s probably up there with “What time is it when an elephant sits on your fence?” as one of the earliest jokes you learn as a kid. There is a serious side to road crossing, however. Roads are a dangerous place if you are a bird and there are no guarantees that by crossing them you will, in fact, get to the other side. Roads are estimated to affect as much as 19% of the total area of the USA and 28% of the land area of New Zealand! That’s a lot of habitat and wildlife species have to deal with roads on a regular basis. One species that is commonly sighted near, and unfortunately on, roads all around New Zealand is the pukeko (Porphyrio porphyrio melanotus). A recent study by Clare Washington (Lincoln University) published in New Zealand Natural Sciences looked at the roadside behaviour of Pukeko. The study was based at Otakaikino Reserve, just north of Christchurch, a wetland surrounded by motorways, with a resident population of pukekos who must regularly deal with roads. Clare spent 18 months observing the birds. She banded the resident birds and found that, although they were regularly on the roadside, they were not the birds that were struck by cars during the study; the dead birds seemed to be those that were wandering through the area. So why were the birds by the road? Roadsides can also be resources for birds. 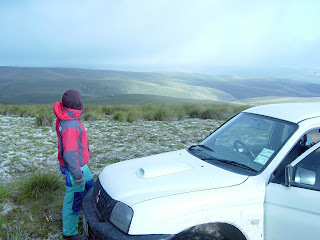 Clare found evidence that foraging was important near the road. 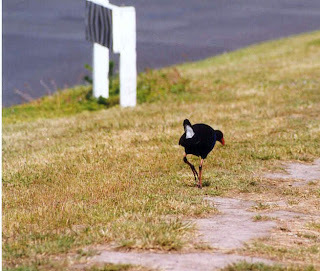 Roadsides are regularly mowed and pukeko prefer new shoots of grass (wet weather and spring conditions also bring them to the road verge to feed on the flush of new growth). Pukeko also need grit for their gizzards. Gizzards are pouches in the digestive system where coarse food is ground up using pebbles to help with digestion. There are few sources of grit in the wetland and the birds were able to search along the roadside for hard rocks, like quartz. Finally, roadsides are very open spaces compared to wetlands and the birds tended to congregate in social groups far more than would be randomly predicted. Perhaps the roadside is a good place to look for potential mates, establish dominance or just gossip! The roadside appears to offer both danger and resources to local birds and this study underlines how little we actually know about this critical habitat. The blue penguin (Eudyptula minor) is found around New Zealand’s coastlines and in many parts of south-eastern and western Australia (where they are sometimes known as fairy penguins). Over the years there have been many different suggestions put forward to explain the regional variations seen throughout the range of this species. 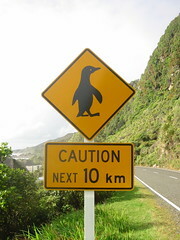 Early researchers had hypothesised that each geographical region of New Zealand contained a subspecies of blue penguin. Molecular data from gene regions is often ideal for examining these kinds of hypotheses and a study in 2002 found only a little support for regional differences but a lot of support for major differences between blue penguins in New Zealand and Australia. In a follow-up to this study Adrian Paterson, Rob Cruickshank, Gabby Drayton (Lincoln University) with Jonathan Banks (University of Waikato) have examined the regional genetic variation of blue penguins across Australia in a paper published in NZ Journal of Zoology. Samples were taken from a western Australian and Victorian populations (which are thousands of kilometres apart). The team examined the fast evolving control region and the slower evolving cytochrome B gene regions of the mitochondrial DNA from each penguin sample. The western Australia n individuals were found to be the same as the Victorian samples implying that there is a high level of gene flow between east and west Australia (more than from the east and west coasts of New Zealand for example). The study also confirmed that Australian and New Zealand blue penguins are very different genetically and may warrant becoming recognised as separate species in the future. Curiously, this study also agrees with the earlier study by placing the birds from Otago, New Zealand with the Australian birds rather than the other New Zealand populations. This result is hard to explain at present and will provide impetus for further studies. Tuatara, leiopelmatid frogs, weta (Orthoptera), peripatus (Onychophora), southern beech (Nothofagus) and kauri (Agathis australis) and other New Zealand species are often referred to as Gondwanan taxa. What does this mean? Gondwanaland was a large landmass made up of the southern continents that slowly broke apart through Jurassic and Cretaceous time. The New Zealand area began to break away from Eastern Australia and Antarctica around 83 million years ago in a large chunk of land the size of India, called Zealandia. Slowly this landmass sank. All that remains of this small continent are New Zealand, New Caledonia, Norfolk, Chatham Islands and the subantarctic islands. The term ‘Gondwanan’ is given to species whose distribution recalls this ancient history. In a series of papers, Adrian Paterson (Lincoln University) and Steve Trewick (Massey University) have been questioning the relevance of Gondwanaland and its influence on modern New Zealand species 1,2,3. In an upcoming paper in Philosophical Transactions of the Royal Society B special issue on evolution on Pacific Islands, they, along with Julia Goldberg (a PhD student from Massey University), explore what the term ‘Gondwanan’ actually means for New Zealand species. The term ‘Gondwanan’ seems to have been used by scientists in at least three different ways. First, a taxon is Gondwanan if its lineage has been continuously present in New Zealand since Zealandia broke away from Gondwanaland. Second, a taxon is Gondwanan if it is descended from a lineage that was present in Gondwanaland prior to break-up but arrived in New Zealand after Zealandia broke away from Gondwanaland and sank (dispersed and colonised). Third, a taxon is Gondwanan if species are currently found in former Gonwanaland landmasses but with no expectation of a common historical process to explain different instances of this pattern (which could be because of either of the two meanings above). For example, penguins are found in New Zealand, Australia, southern Africa, South America and Antarctica and certainly demonstrate a Gondwanan distribution (third meaning). Penguins have a fossil history to at least 62 Myr ago and molecular analyses suggest a much earlier origin in the Gondwanaland landmass, implying that they are found in the New Zealand region by virtue of having been in Gondwanaland when Zealandia rifted away (first meaning). 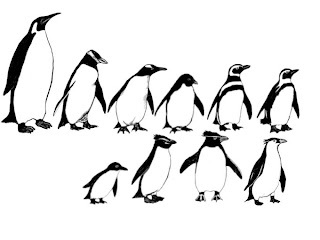 Fossil and molecular data all suggest that modern living penguin species all share a recent ancestor from about 25-30 million years ago. Living penguin genera of Eudyptes, Eudyptula and Megadyptes may have colonized New Zealand from other former Gondwanan landmasses since that time (second meaning). 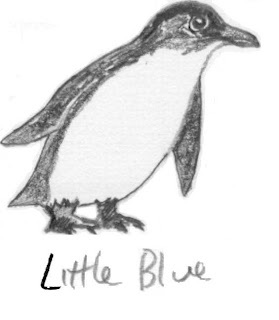 Indeed, Eudyptula, the blue penguin, is found in Australia and New Zealand with molecular evidence for recent contact between these populations. Thus, the modern distribution of penguins could be described as Gondwanan in all three senses. Does it really matter; it’s all Gondwanan isn’t it? Science is about being precise, removing ambiguity and these three meanings suggest different things. Meaning three simply acknowledges that there is a group of species that share a certain southern hemisphere pattern. Meanings one and two provide different explanations for the origin of this pattern with meaning one implying species have been continuously in New Zealand for 80 million years and meaning two implying that the species could have arrived at any time over the last 80 million years. Understanding the difference will allow biogeographers (scientists that study where species are found) to be better able to tell the complicated story of the history of the New Zealand’s biota.